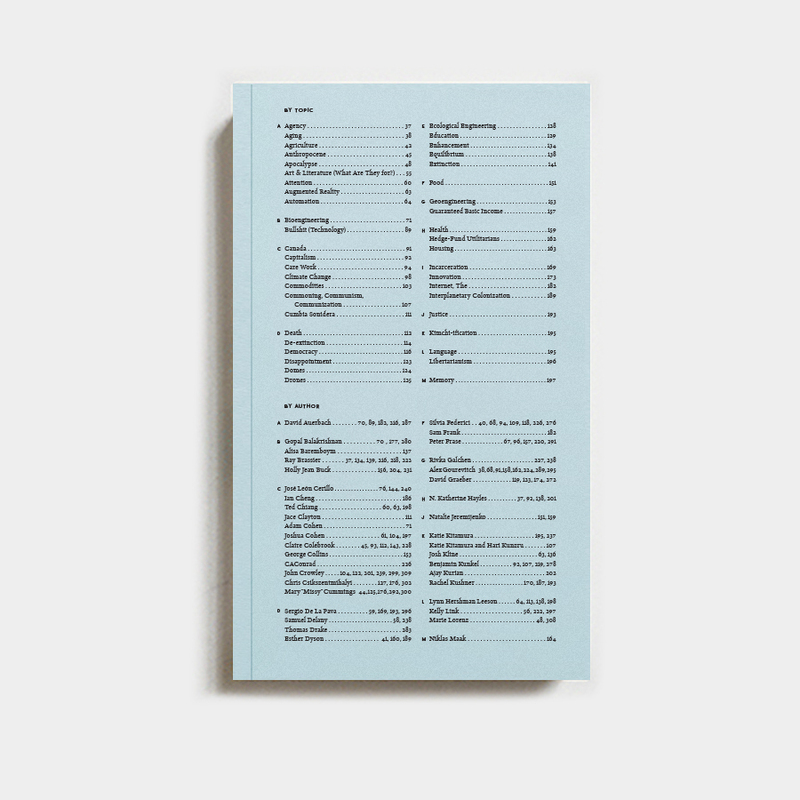 Perfect-bound, 336 pp, 4.25" × 7"
In the summer of 2013, Triple Canopy invited more than sixty writers, artists, scientists, activists, economists, and technologists to make bets on the future. Triple Canopy asked: Which future do you want to see realized? How precisely can you describe it? What demands might this future make on the present? These speculations were to be optimistic, even if that optimism were skeptical or dark. They were presented as Speculations (“The future is ______”), a fifty-day series of lectures, discussions, and debates at MoMA PS1, Triple Canopy’s contribution to the exhibition “EXPO 1.” In subsequent months, Triple Canopy continued the speculations by way of public conversations about climate change and inequality, geoengineering, and the way in which we conceive of and represent nature. This book, a lexicon of central terms of Speculations, is meant to convey the relationship between ideation and action, in order to suggest viable approaches not just to interpreting the world but to changing it. Triple Canopy considers economic interventions (“guaranteed basic income”), political abstractions (“reform or revolution,” “prometheanism”), figments of the imagination (“interplanetary colonization”), emerging technologies (“enhancement”), and useful neologisms (“hedge-fund utilitarians”). Each of the more than sixty entries consists of edited excerpts from speculations made by, among others, Fatima Al Qadiri, David Auerbach, Gopal Balakrishnan, Ray Brassier, Holly Jean Buck, Ted Chiang, Jace Clayton, CA Conrad, John Crowley, Samuel Delany, Esther Dyson, Silvia Federici, Rivka Galchen, David Graeber, N. Katherine Hayles, Katie Kitamura, Josh Kline, Benjamin Kunkel, Rachel Kushner, Lynn Hershman Leeson, Mary Mattingly, Naeem Mohaiemen, Evgeny Morozov, Hương Ngô, Trevor Paglen, Ashwin Parameswaran, Christian Parenti, Laura Poitras, Srikanth Reddy, David Rieff, Kim Stanley Robinson, Norman Rush, Sukhdev Sandhu, Edward Snowden, Astra Taylor, Mierle Laderman Ukeles, and Kathi Weeks. The book includes new artwork by José Léon Cerillo, who created the structure that housed Speculations at MoMA PS1. Distributed in North America by ARTBOOK | D.A.P. Major support for Speculations (“The future is ______”) has been provided by MoMA PS1, the Truckin’ Foundation, Robert Rauschenberg Foundation, and Triple Canopy’s Publishers Circle.